Mark Penn and Andrew Stein slam transgender rights in asinine New York Times op-ed. Former North Carolina Republican Governor Pat McCrory campaigns for Donald Trump. 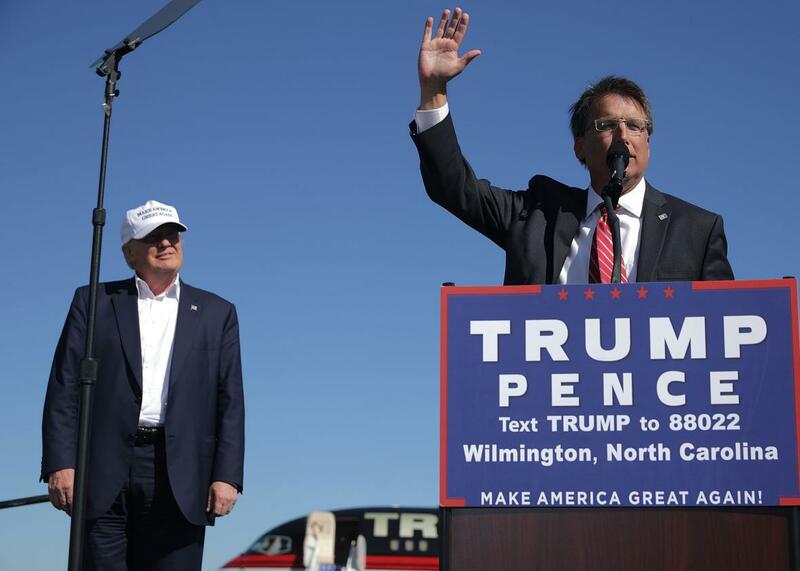 Although Trump carried the state, McCrory—a fierce opponent of trans rights—lost to a Democrat, Roy Cooper. On Thursday, failed campaign strategist Mark Penn and money-laundering Trump supporter Andrew Stein declared in a New York Times op-ed that the Democratic Party must “move to the center and reject the siren calls of the left.” Penn and Stein’s ornery manifesto urges Democrats to imprison more opioid addicts, champion “tough anti-crime measures,” end sanctuary cities, and crack down on undocumented immigrants. The whole op-ed is really just an endorsement of centrist white nationalism filled with catastrophically asinine proposals that, if adopted, would enrage most Democratic voters. (Why, after all, should the diverse and progressive Democratic base cater to the prejudices of white ethno-nationalists who are already fleeing the party?) Yet the silliest line in the whole affair involves not race but gender: Penn and Stein exhort Democrats to abandon “transgender bathroom issues” for their own good. We’ve seen this advice before. Shortly after the presidential election, the Times published an op-ed by Mark Lilla calling for “the end of identity liberalism.” Lilla criticized Clinton for her “rhetoric of diversity,” as well as her focus on the concerns of “African-American, Latino, L.G.B.T. and women voters.” To drive home his point, Lilla proclaimed that “America is sick and tired of hearing about liberals’ damn bathrooms.” Straight white men who’ve never had to think twice about using the bathroom in safety are obviously very perturbed that the Democratic Party backs transgender rights. We’ve seen this dynamic play out on the state level repeatedly over the last few years. In North Carolina, then–Republican Gov. Pat McCrory staked his career on support for the state’s controversial HB2, which restricted trans bathroom use and nullified local LGBTQ nondiscrimination ordinances. He lost to a Democrat, Roy Cooper, who ran on opposition to HB2—while Trump carried the state by nearly 175,000 votes. McCrory’s loss is almost certainly attributable, at least in large part, to his relentless defense of HB2. In South Dakota, Republican Gov. Dennis Daugaard vetoed a bill that would have prevented trans students from using the school bathroom that aligns with their gender identity. In Georgia, Republican Gov. Nathan Deal vetoed an anti-LGBTQ “religious liberty” law that also would restricted trans rights. Both governors feared toxic backlash—not only from liberals, but also from independents, moderate Republicans, and the business community. In Texas, these factions are currently at war over trans bathroom use. Far-right Republican Gov. Greg Abbott and Lt. Gov. Dan Patrick, a reactionary zealot who also serves as president of the state Senate, are pushing for an HB2–style bill that would exclude trans people from many public restrooms. But Speaker of the House Joe Straus, a centrist Republican, has continually foiled their efforts. According to Lawrence Wright’s astonishing New Yorker report, Patrick sent a state senator to Straus’ office with an envelope containing “the language of a bathroom bill that Patrick would accept.” Straus told the senator not to bother opening the envelope. The fact that Straus is defending trans rights demonstrates just how quickly Americans of all stripes have evolved on this issue—an evolution carefully guided along by Democrats. Today, moderate Republicans can go to bat for trans youth because the Democratic Party held the line on trans equality. After McCrory signed HB2, Democrats embraced trans bathroom rights as a national issue, cheering on the devastating boycotts and making an example of North Carolina’s bigotry. By refusing to condone anti-trans discrimination, Democrats elevated bathroom access to a genuine civil rights debate. And in November, North Carolina voters chose civil rights over potty prefects. Penn and Stein, of course, note none of this. Nor do they acknowledge that it’s actually Republicans who are obsessed with trans bathroom use: If either party needs to lay off “transgender bathroom issues,” it’s the GOP, which is fixated on dictating where trans Americans can and cannot pee. Democrats are merely doing what their party is ostensibly committed to doing: protecting the rights of a vulnerable minority. If Penn and Stein can’t get on board with that goal, they should stop offering Democrats unsolicited advice. After all, America already has an openly bigoted, white nationalist party that would welcome the worst ideas with open arms. It’s called the GOP.